It has been a busy 2 months for me and my team in launching the Investment Account to replace the out-going Mudharabah Current Account and Savings Account. No longer are these accounts classified as “Deposits”; as at 1 July 2015, they are officially re-born as “Investment Accounts”. What does being re-born as Investment Account means? The customers relationship with the Bank is re-iterated as “Fund Provider and Entrepreneur”. The relationship of Mudharabah has always been the same either before or after 30 June 2015. But now we re-emphasize this fact again. 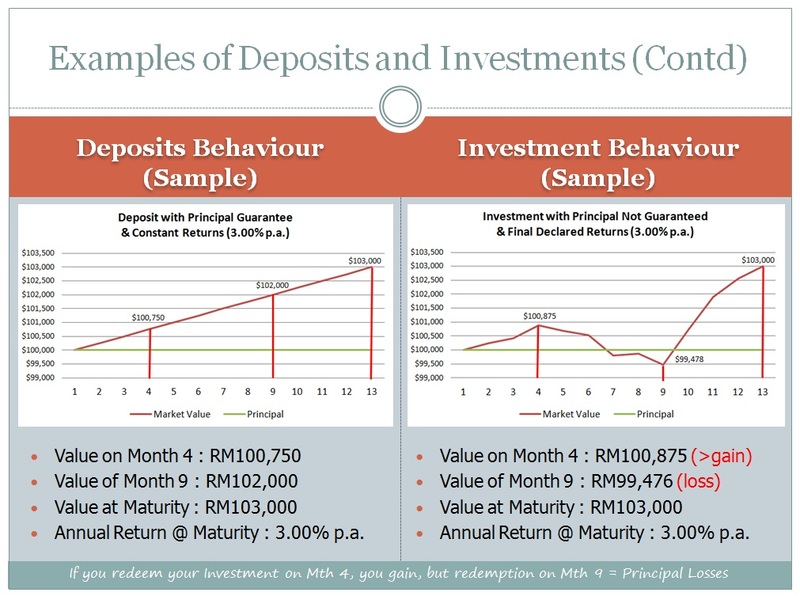 By reclassification of the Current Account / Savings Account into the “Investment” definition, PIDM no longer can cover the products (since PIDM stands for Perbadanan Insurans Deposit Malaysia). Customers now will need to be risk-rated for going into Investment Account. Customers will be asked questions to determine the risk-tolerance level and whether the product will be suitable for them. 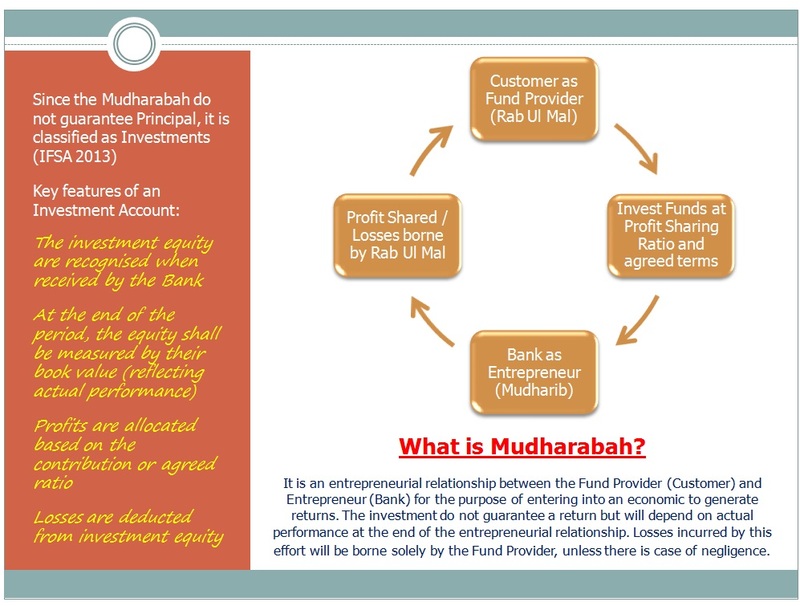 The current reincarnation of the Mudharabah product carries very little risks, so it is most likely almost all customers will qualify for the Investment Account. Customers will have more information about the use and deployment of their funds as Banks are required to be transparent to the customers. Customers will know where their money is being invested into, the potential risks and returns and hopefully with the availability of all disclosures and information on the investment, will be equiped to make a decision to go into investments. Banks will be more involved in managing the customers’ funds as Banks need to manage the assets that is allocated to the investment pool from which the actual returns will be paid to the customer. In the near future, we foresee that the function in the Bank involves active management of the investment pool, much like what a fund manager would have to do on a daily basis. 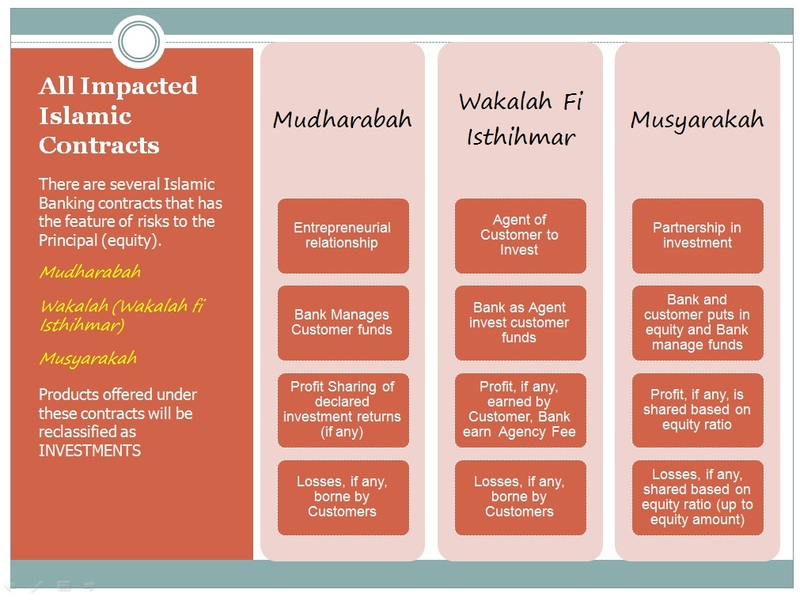 For customers who was unsure of the Investment Account and its impact to them, they would not have opted into the Investment Account; instead they are converted into a less riskier “guaranteed principle” contract of Wadiah. Wadiah is a “Safe custody” contract which guarantees the return of principal on demand, but offers nothing else. Any returns paid will be as a gift (“Hibah”) and such Hibah is purely discretionary (not obligatory). 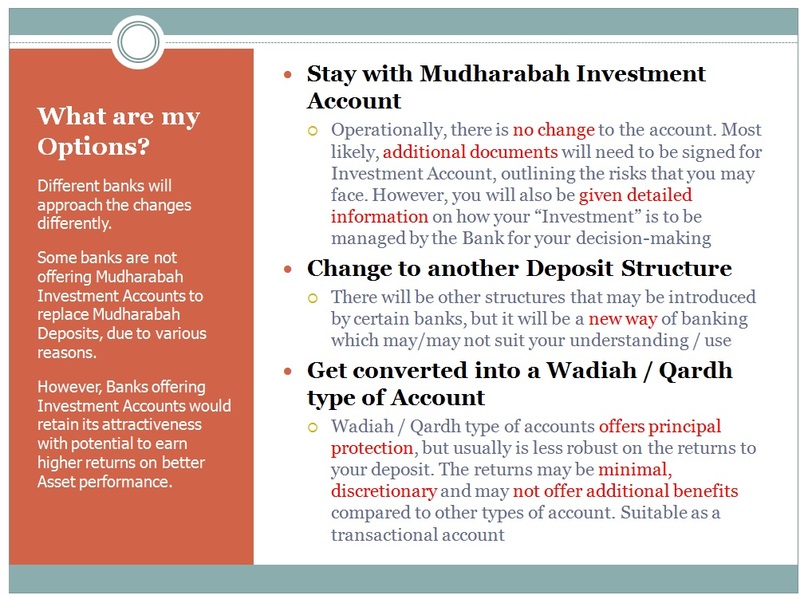 My advice : For customers whom have been converted into Wadiah arising from the Mudharabah migration exercise, do visit your Banks and ask to explore Investment Account, as essentially the accounts remains tightly managed by the Bank to generate the desired returns. We are all excited to take this contract forward and see its response. We note the feedback from customers on Investment Account and it will be a challenge for us as the market slowly wakes up to this new understanding. It could take years of educating the public on Investment Accounts, and it will be a while until we ourselves reach peak efficiency in understanding its dynamics. I am sure my other colleagues from the various Banks are also basking in the struggles and achievements of launching the Investment Account. It was a team effort to have the product on-board and we can only get better from now on. The market will warm up to the idea sooner rather than later as all the Banks try to meet what is expected of the under the IFSA. 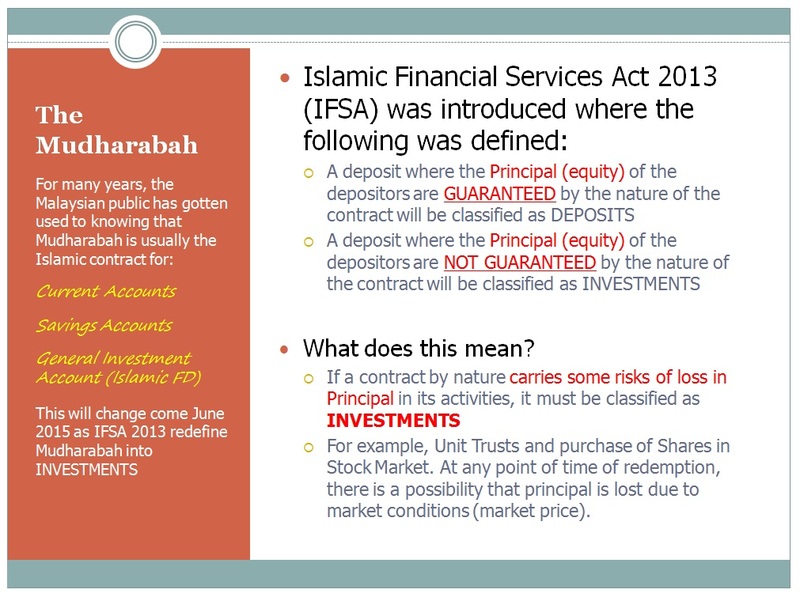 In the meanwhile, I attach an entertaining clip from my good friends from Maybank Islamic, whom also launched their version of the Investment Account. Hopefully the Colourful Maybank Investment Account clip (You Tube) will serve as a good introduction to all. 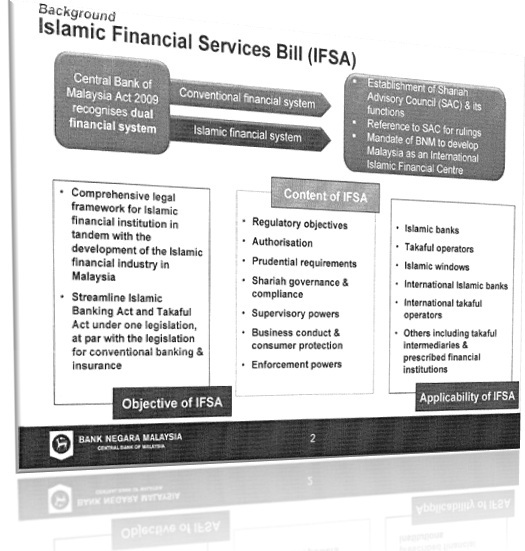 The Islamic Financial Services Act (IFSA) 2013 was introduced to streamline the Islamic Banking definitions and practices. With the introduction of this Act, we obtained clarity on many matters, but not all of it is in our favour. From the Act, we see a significant re-defining of the Deposit product. Needless to say, the Islamic Banking industry is at arms on this new definition. But to classify it as a new definition is also not entirely accurate. We have been taking in Mudaraba-based deposits as our main method of accumulating deposits in the Bank. Mudaraba by nature is profit-sharing investment arrangement for the purpose of obtaining a return. Any profits arising from this investment will be shared amongst the entrepreneur and the capital provider based on agreed ratio; whereas for any losses, it will be borne by the capital provider, unless the entrepreneur is proven negligent. In all intent and purposes, this is an investment, rather than deposits. However, while there is a risk to the investment, this is mitigated by way of investing in low risk intruments, profit equalisation or even gift (hibah) to ensure a customer’s capital is not lost. Technically an investment, but with indirectly guaranteed capital due to the above mechanisms. Furthermore, this is augmented with the deposit insurance offered by the Malaysian Deposit Insurance Corporation (PIDM) which insures the customer’s deposit with the Bank, should a Bank goes belly-up. With such assurances, Banks have taken these Mudaraba placements as “Deposits”, categorised internally as part of the Core Deposits calculations i.e. low risk deposits. Why this is important is because if you have higher Core Deposits in your books, you can therefore fund a higher proportion of your financing portfolio, without adding more Shareholder’s capital. Technically, under the Loans to Deposit Ratio (L/D Ratio), the Bank can hold a bigger financing portfolio the higher the Core Deposit amount. This is the desirable outcome. To collect higher “Core Deposits” via Savings Account, Current Account and General Investment Account (Term Deposits). 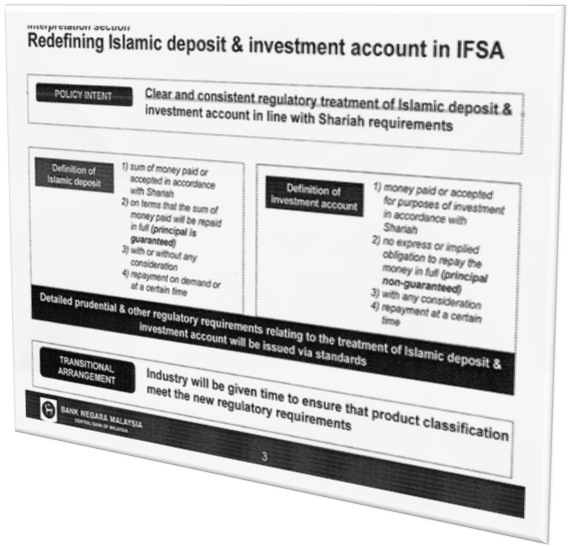 With the new IFSA, the Core Deposit definition is redefined. If the return of the customers deposit (capital) can be guaranteed, this capital is classified as Deposits. If the return of the customers deposit (capital) cannot be guaranteed, this capital is classified as Investments. With this, the industry is turned on its head. Obviously, a Mudaraba, or Wakala fi Istihmar (Agency for the purpose of Investment) will be classified as “non-Core Deposits”. The nature of Mudaraba is investment, and no matter what mechanism one puts into the product to “protect capital”, one cannot GUARANTEE capital due to the potential of loss. This risk sharing is one of the key tenets of a Mudaraba arrangement. By keeping to this tenet, Mudaraba should be classified in its rightful place i.e. Investment. As mentioned, removing the deposits as reclassifying it into Investment has significant impact on the L/D Ratios. 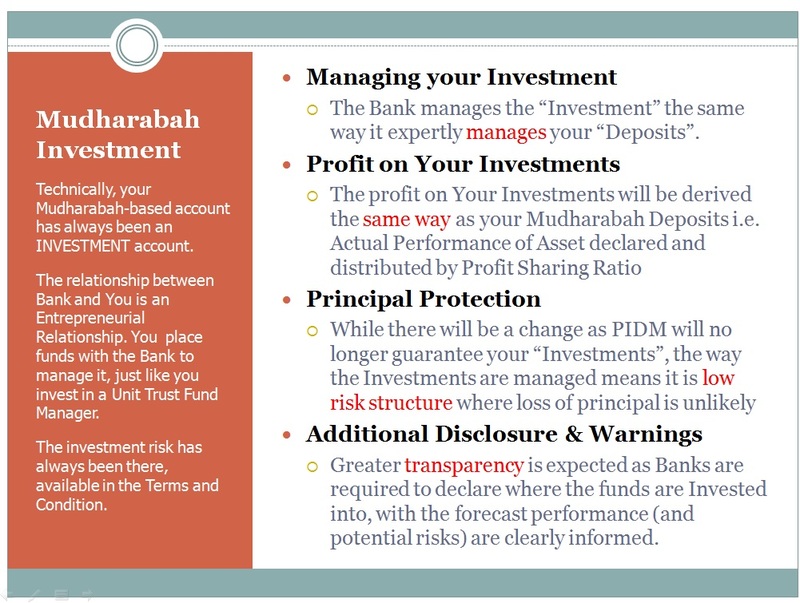 But also, what’s worrying is that to keep Mudarabah (or Wakala), now defined as Investments, there is a separate Investment Account Guidelines which the Banks will have to comply with. Now that’s another story. Develop new deposit structures that will meet both the Deposit definitions and meet customer demands for returns on their deposits and savings. Unfortunately, the available structures in the market requires extensive capital and technological enhancement, while operationally not viable. The industry as a whole has so far not come up with any viable proposition. Research has been done but the disadvantages of such structures outweigh the benefits. This re-classification, may on the onset, looks a simple thing. But the impact is huge. 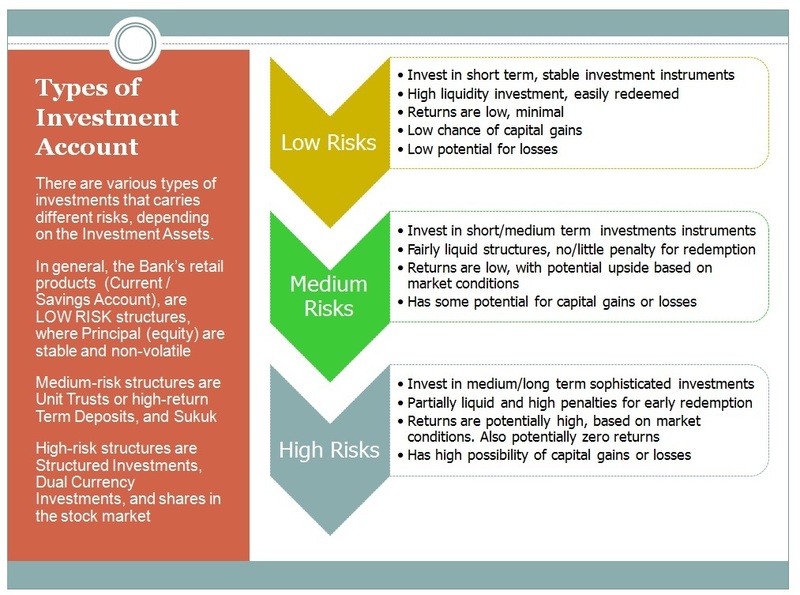 The risk of capital flight is significant, possibly flight into conventional banking if the consumers are not able to accept the risks of investments or the returns uncertainty of deposits. It will be interesting to see what the industry comes up with. I remember following BNM briefing on the re-classification back in 2011, the boss has asked me to come up with a Term Deposit under the contract of Wadiah. He knows it is not feasible, but still he asked for it. It only reflects how desperate the time will become when the full significance of the Act is enforced on us. Now that it is enforced, I wondered if the rope around my neck is long enough.